A lot about the card world focuses on big hits and popular releases, but the hobby also has the ability to inspire and motivate. Daniel Alexander, a boy diagnosed with an inoperable brain tumor as a 9-year-old, is one such example. Upper Deck and Friends of Jaclyn have paired up to produce a special baseball card for Daniel Alexander. Following multiple surgeries and chemotherapy, Karen Alexander, Daniel's mom, reached out to Friends of Jaclyn (FoJ). Thanks to the organization, Daniel Alexander was essentially "adopted" by the Notre Dame baseball team in 2013 and his mom said it had a direct effect on him. 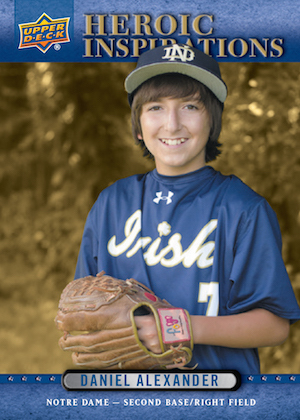 "Daniel's disposition changed immediately after being involved with the Notre Dame baseball team through Friends of Jaclyn," said Karen Alexander in a press release. "Daniel immediately clicked with these young men. He knew these athletes were going to give him the support he would need, but most importantly he was making friendships that would last a lifetime. FoJ was able to pair Daniel up with his love of baseball and his new love of Notre Dame Baseball. Being on this journey makes it so much more bearable when you know Daniel has 38 big brothers cheering for him!" 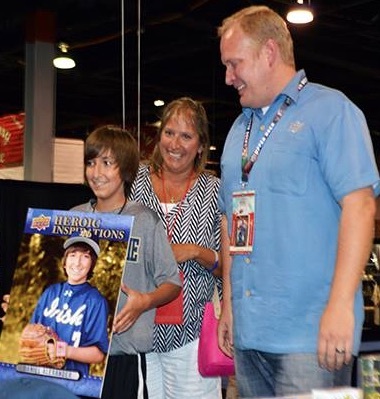 Celebrating that bond, Daniel Alexander and his mother were both honored by Upper Deck at a special ceremony during the 2015 National Sports Collectors Convention. The card maker presented Daniel with his own baseball trading card and hundreds more will be produced to help raise money for the family. Additional details about the card availability or pricing are not yet known. This is not the first time Upper Deck and Friends of Jaclyn have teamed up on a special card. In recent years, Jack Hoffman and Jack Miller each received similar recognition with their own football cards. Also, while it was not part of the FoJ relationship, a card from the Heroic Inspirations line was issued for college basketball player Lauren Hill.